Agriculture Sprayer Double Motor Pump: With a capacity of 22 liters, our double motor pump sprayer can operate on a 12V/14 Amp battery. 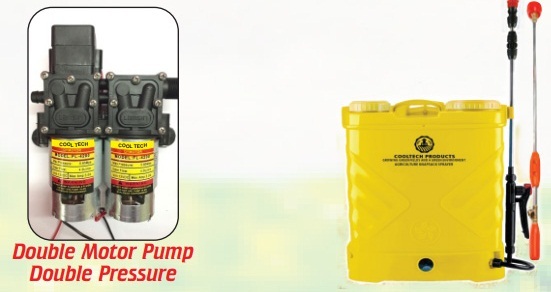 It has a capacity of 8 liter per minute discharge for spraying in large-scale farmlands in a speedy manner. Once the battery is charged, it can be used to distribute pesticides and other solutions with a full force for a complete crop protection. With 5 plastic nozzles, the sprayer features a 3-piece standard outer box packaging. It comes with the stainless steel hijet gun with brass head and brass connector for a long-term and durable performance.